Diners here claim they saw a stack of kids' activity place mats fly into the air of their own accord. Probably something you'll want to look in to. Hints are available for each mini-puzzle separately. Time offsets are from the very beginning of the whole puzzle, and assume if you get stuck on one mini players will just move on to another. Each of the five solves should be reminiscent of something else on the place mat. Squinty is the final solve. If you hadn't noticed yet, the word lengths for the mini solves can be found upside down on the bottom of the page. If you color in the place mat correctly, and maybe squint a little, you can read the final message. For instance, the solve for the Word Search is ARROW. There are two islands marked with a sign post with arrows on it. Find the shape(s) of those islands within the coloring page and color them in. Only color in shapes that are represented by the 5 solves on the flip side. When you find all the words, the puzzle will look like a maze with a message along the path. The message asks you to think about the choices you made, so focus on the points that you chose one path when navigating the maze. Specifically, look at the letters that happen at intersections. There are 5 of them on your path. Spot the differences: Each difference is also one letter off from the other. Like BRAD and BEAD. You can confirm your guesses. Focus on the one letter that is different. Write that letter on the image. Read down through each image; left image and then right image. Unjumble the words based on the clues. Use the highlighted letters to complete the message at the bottom. After you have the message, look back at the grid for buried treasure..
Notice each word (and jumbled word) has an X in it. Use the X from the jumble as well as the unjumbled word. Where would a pirate keep his treasure?. Under the "X", so take the letter that appears directly under each X in the grid. Read down. When you have that answer, think about a fitting 6 letter solve that has an X..
Each Menu item solves to a single-word food. The dollar value is the order. The cents is an index into the word. The dots in between the item and price, is an enumeration of a phrase. Each menu item is a clue for phrase that has a food item in it. CHICKEN out. Drink like a FISH. Index into the food item by the cent value and order by dollar. Also each food item fits into the category of Meat, Topping , and Drink for extra help. Start by solving each number as A=1. Lastly, connect the dots. The message hints at a song called "Cosmic." Notice that the letters from COSMIC only appear in the Connect the Dots message once. Using COSMIC, start with the first letter and draw a line to the second letter. Continue and end with the last letter (which is the first letter again). 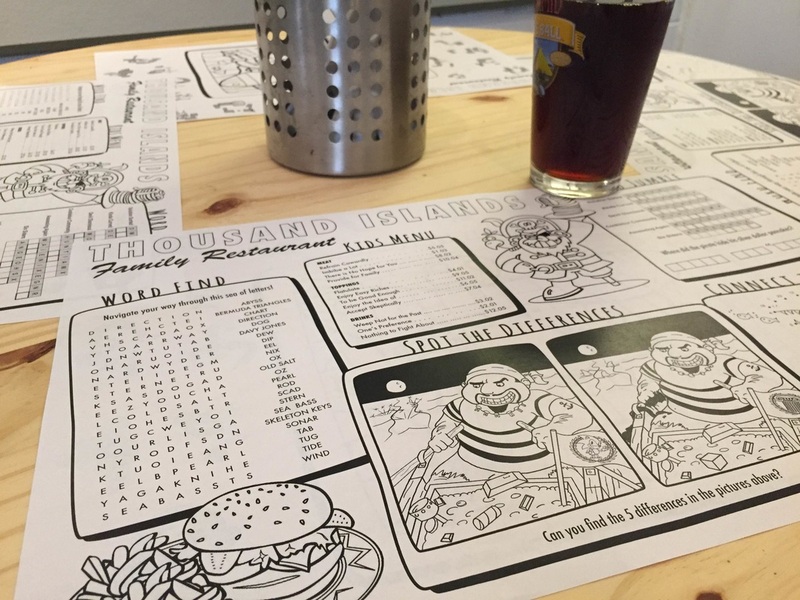 You have probably guessed that there are five bits of information to get on the front of the placemat and you should color the back last. Only color the matching "islands" that are referenced in the solves on the other side. There are 2 for each solve, so you will use 10 islands, naturally.